A claim frequently made by animal rights activists is that by paying for animal research charities and other funding bodies are diverting money from other areas such as clinical research. However the reality is that clinical and animal scientists work together to understand what is going wrong in disease and to illuminate previously unknown aspects of biology. A good example of this process is provided by media reports that scientists studying the low incidence of solid cancerous tumours in people with Down’s syndrome have discovered exciting new targets for the treatment and prevention of cancer. The team led by Dr Sandra Ryeom of the Children’s Hospital Boston knew that among people with Down’s syndrome the mortality rate from solid tumours is less than 10% of what would be expected, indicating that one or more of the 231 genes that people with Downs syndrome have an extra copy of as a result of the chromosome 21 trisomy (three copies rather than the normal two) is responsible. But which gene? 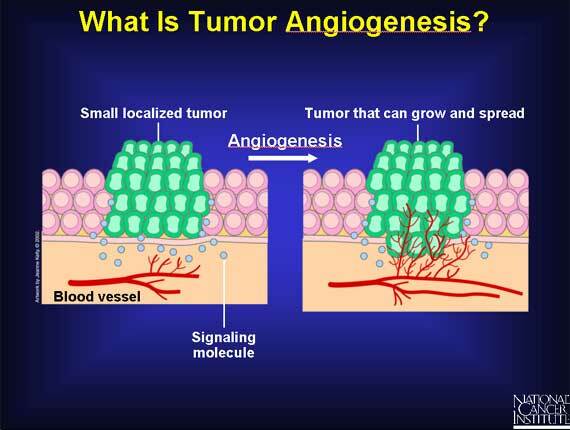 From earlier in vitro studies they knew that large amounts of a protein called DSCR1 could block angiogenesis* by suppressing a pathway activated by the hormone vascular endothelial growth factor (VEGF) that is produced by many tumours. What they wanted to know was whether the relatively small increase in the level of Dscr1 seen in Down’s syndrome could block angiogenesis, and to do this they turned to animal models where the interaction of tumour cells with surrounding tissues, including blood vessels, could be studied, and in particular to the Ts65Dn mouse model of Downs syndrome where the mice have an extra copy of 104 of the genes found in human Down’s syndrome and exhibit many Down’s symptoms. In their paper published online in Nature (1) they describe how Dscr1 is one of the 104 extra genes and that when they transplanted two types of cancer cell into the mice they found that the tumours grew far more slowly in the Down’s mice than in control mice. On examination tumours from Ts65Dn mice were found to contain fewer blood vessels than those from control mice. Taken together with the clinical observations of the low levels of solid tumours in people with Down’s syndrome these results emphasize how important angiogenesis is to the transition from non-cancerous micro-tumours to larger tumours that may eventually metastasize, and identify the VEGF-calcineurin-NFAT pathway as a promising target for the development of new anti-cancer drugs. It seems appropriate that the author list of this very interesting paper that will no doubt stimulate much research over the next few years includes Judah Folkman, a true pioneer in the field of angiogenesis who died last year. Posted on May 27, 2009 May 27, 2009 by EditorPosted in News, Science NewsTagged animal research, cancer, Downs, Downs syndrome, Dr Sandra Ryeom, Judah Folkman, mouse model, paul browne, speaking of research, synergy.